I've written for several websites since I started working as a freelance writer over five years ago. I write for Wordgigs and Textbroker, and some of you know I used to be a contributing writer on Work at Home Adventures. I mostly wrote SEO-optimized blog posts for these websites. I've been wanting to start writing other types of content, such as press releases. I've also been trying to find ways to earn more from my writing. Recently I found the website Get a Copywriter, signed up and started writing for them. I've been very happy with my experiences so far on that website, so I wanted to share a little about it with you. Get a Copywriter is a website where writers can sign up to write different types of content, such as blog posts and press releases. What Countries Does Get a Copywriter Hire In? 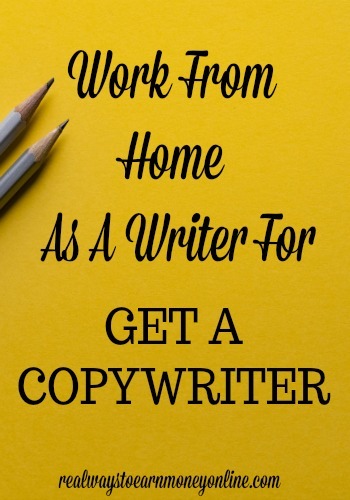 Get a Copywriter hires writers from the United States, Canada, Australia, New Zealand, the United Kingdom, the Republic of Ireland, and some countries in the European Union. What Subjects Do Companies Submit Requests For? They also have an “other” category, which is very popular among clients according to the website. How Do I Claim Assignments? Once you've written a few test articles and been accepted in different categories, you'll start seeing assignments in the general queue. Get a Copywriter also sends a digest of available assignments once or twice a day depending on how much work they have. When you first start writing for Get a Copywriter, you'll have to submit a pitch for an assignment that provides general information about your experience and how you would go about writing the assignment. If the client selects your pitch, you'll receive an email telling you the assignment has been awarded to you and how long you have to submit the assignment. Assignments are also occasionally listed as “instant claim” assignments – that means the writer doesn't have to submit a pitch. How Long Do I Have to Research and Write the Article? The default timeframe for most assignments is three days. Occasionally Get a Copywriter will send emails to writers asking them if they can finish an assignment another writer claimed but was not able to finish – in that case the timeframe may be shorter. What Happens If I Can't Meet the Deadline? If you email support within 12 hours of the deadline, there's no penalty. If you miss a deadline by more than 12 hours without any notification, Get a Copywriter will reassign the project and suspend your account. How Long Does the Client Have to Review the Article Once I Submit It? The client has five days to review the article; however, they may request an extension if they can't review it in 5 days, or if they've filed a dispute. That depends on the length of the assignment. I've made as much as $57 for a 2,000-word article, and as little as $14 for a 400-word article. How Do They Pay Their Writers? Get A Copywriter sends payment to their writers once a week once they've made $15. Writers in the US get paid by bank draft through Bill.com, and writers in other countries get paid by Paypal. To apply with Get a Copywriter, just go here to apply. Get a Copywriter is a great place for writers to get more experience writing different types of content for different clients. I highly recommend it to anyone who wants to expand their experience. To get tips and find out about tools that help make life easier for people who work from home, be sure to check out my website, Work at Home Tips Online, and follow my Facebook page.